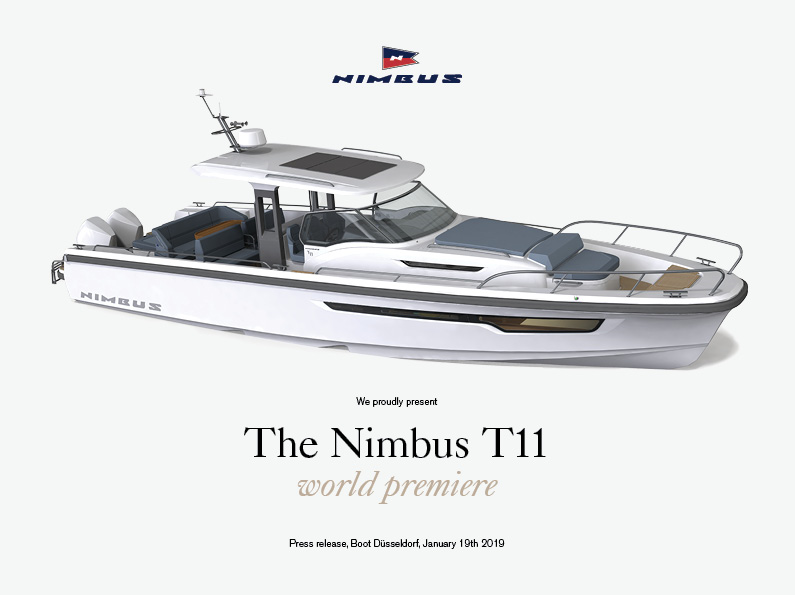 The Nimbus T11 is a 12.5-meter-long walk-around for excursions with plenty of space for up to 12 people to socialize or take part in activities, while also providing enough room for everyone onboard to face the direction of travel when moving at higher speeds. Throughout the design process Nimbus was constantly guided by a single question: “What components make for the best days out on the sea together in great company?” The answer was big, flexible socializing spaces, plenty of room to move around, good protection from the sun that covers a good part of the boat and several spots to lie back and sunbathe or sit in. It was also plenty of fridge space for storing food and drink, a proper outdoor kitchen with barbecue, a large bathing platform with room for several people to enjoy a dip at the same time and finally an extra-large but easily accessible stowage area for gear and toys. “In the design and development process, we have deliberately focused on “simplicity” and “easy living” for everyone on board. It includes being able to easily and conveniently board or leave the boat, to load, to travel, to stay aboard and to own the boat. Everything that has to do with your Nimbus should feel natural and easy regardless of activity. When things are easy, we quite simply feel more relaxed and can focus on the boating experience. Says Mats Jacobsson ”, Technical Director at Nimbus. The boat’s heart is found in its lounge area. This is an extra spacious and multifunctional socializing space that can be easily adapted to different activities such as cruising, sunbathing, swimming, entertaining, lunch and dinner or a quiet afternoon of reading in the shade. Flexibility is provided by sofas, tables and awnings with simple handles that can be used to rotate, fold and move into different positions depending on what it is you want to do. The lounge area has three sofas and a large table which, depending on its position, can function as a sun deck or a seating area that can either have all seats facing the direction of travel or alternatively facing one another. The outdoor kitchen has drawers for cutlery and tableware, a kitchen sink with hot water and space for a gas stove or electric grill. The large stowage space measures just over 2500 liters and boasts a hydraulic opening mechanism that is easily accessible from the after-deck. It has space for everything you could ever want to bring with you, whether that be SUPs, sea bobs, wakeboards and biscuits or simply an inflatable rubber boat. The bathing platform and the after-deck are ample and easily provide enough space for several people at the same time. The cockpit is snuggly put together in the typical Nimbus fashion, with extra storage compartments and space for three people to sit in the direction of travel. The foredeck offers room for a divan and a sun bed. Much like the T9 series, the T11 also has a large storage hatch at the front of the cabin. Thanks to the large gunwale sides, the foredeck can also be used as a seating area and socializing space. Below deck you will find two separate cabins with space for two couples or a family of four. Spacious bathroom with toilet, shower and sufficient headroom. The T11 series has a new, well-balanced stepped hull with great high-speed properties in combination with a low planning threshold. The front hull is sharp in order to easily cut through the waves and it is fitted with an ample flare that protects against spray and makes for a drier ride. The boat comes equipped with two Mercury Verado V8 300 motors as standard and the speed range is between 20 and 40+ knots. For those who want to go even faster, the T11 can be fitted with three Mercury Verado V8 300 motors which, according to our calculations, would allow the boat to reach up to 50 knots. The boat can also be fitted with inboard engines. The T11 is a model in the Tender series which is a replacement for the successful Nova series. In contrast to Nova, which was primarily intended for the Scandinavian market, the Tender series aims itself at a broader target group by meeting the needs of users in Southern Europe, Oceania and the USA.